The entrance to a Floran Canyon dungeon. 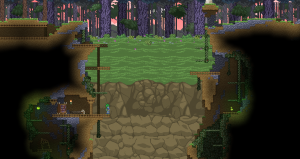 Floran Canyons are a Floran themed dungeon made up of underground caves and patrolled by hostile Floran guards. It has significantly less light than a hunting grounds dungeon, and doesn't have as much structure and windows inside. These dungeons can be found on any planet type aside from moons, any ocean worlds (including magma, arctic, and toxic), or garden planets. They are most likely to appear on forest planets over any other planet type. The entrance is a large hole with wooden scaffolding along the sides. Usually there are some dimly lit caverns before entering into the dungeon itself below. Basic treasure can be found in most containers while valuable treasure is in themed chests. Hunting Spears also occur in valuable treasure containers and at higher rates. Bone Carving Decorative 90 There are barbaric Floran tales etched into the bone. Bone Rack Decorative 70 A rack of 3 unidentified bones. Bones on a Pike Decorative 60 Some bones on a pike. How morbid. Broken Wooden Cage Decorative 90 A broken cage. What could have escaped? Cross Mounted Skull Decorative 50 A skull mounted as a trophy on crossed wood planks. Glowing Orb Storage 90 A glowing orb. It looks like there's room to store things inside. Large Bone Chimes Decorative 70 A string of bones to hang from the ceiling, like a morbid wind chime. Large Primitive Chest Storage 90 A long chest, made from sticks. Its security is questionable. Large Vine Lights Light Source 90 A light made of vines. Or a vine made of lights? Large Wooden Scaffolding Decorative 360 Large logs assembled as a construction platform. Large Wooden Staging Decorative 230 Large logs arranged as a construction staging platform. Leaf Bundle Decorative 70 A bundle of unusually large leaves. Long Black Pelt Decorative 80 A ragged fur pelt, hung from two large tusks. Mossy Platform Platform 0 The platform is slimy with moss and leaves. Better be careful not to slip! Overgrown Table Furniture 120 A wooden table which is overgrown with vines. Penguin Bones Pike Decorative 50 Penguin bones on a pike arranged decoratively. Petal Block Block 0 Sweet smelling dark leaves and flowers. Plant Matter Block 0 A block made of packed plant matter. Plant Torch Light Source 45 This torch is wrapped in a plant covering. Primitive Abstract Art Decorative 55 A Floran's idea of abstract art. Primitive Armchair Furniture 110 It's just an armchair made of bones. No big deal. Primitive Bed Furniture 125 The bone frame is sort of disturbing, but that fur blanket looks mighty comfy. Primitive Bookcase Decorative 145 A bookcase made from the remains of Floran prey. Primitive Chandelier Light Source 105 Torches have been stuck to a sapling in lieu of a fancy chandelier. Primitive Chart Art Decorative 50 It appears to be a tally chart. Primitive Crate Storage 75 A storage crate made of unrefined wood and bone. Primitive Fire Art Decorative 70 This painting seems to illustrate how to build a fire. Primitive Glyph Art Decorative 70 It looks like someone has painted glyphs onto a piece of leather. Primitive Stove Crafting Station 70 A very basic cooking pot suspended over a campfire. Primitive Tanning Rack Decorative 90 An animal pelt stretched and dried between two large bones. Raised Platform Furniture 110 A raised platform. Don't get stuck under it. Retractable Wooden Gate Door 105 A retractable gate, made from a light wood. Ruins Platform Platform 0 An old dusty wooden platform. Looks like it's falling apart. Skull Torch Stand Light Source 85 Deep shadows stretch away from this menacing torch. Skull on a Pike Decorative 50 A skull on a pike. A Floran favourite. Small Vine Lights Light Source 75 A light made of vines. Or a vine made of lights? Small Wooden Cage Decorative 80 A study small Floran prison cage made from wood. Spinneret Trophy Decorative 350 This trophy is a spinneret from some large, web spinning creature. Sturdy Torch Stand Light Source 85 A standing torch. Illuminates the giant beast about to eat you. Suspended Wooden Cage Decorative 120 A hanging cage designed to hold Floran prisoners. Vine Block 0 A thick coil of vines. They look strong. Vine Pod Lamp Light Source 105 A strange green light pod is hanging loosely from a curved wooden post. Vine Pod Light Light Source 75 A large, luminous pod hanigng from a vine. Vine Wall Light Light Source 75 The pod emits a natural green light. Wheeled Bed Furniture 140 A basic bedroll on a wheeled wooden frame. Wicker Support Block Block 0 A tightly woven wicker material.